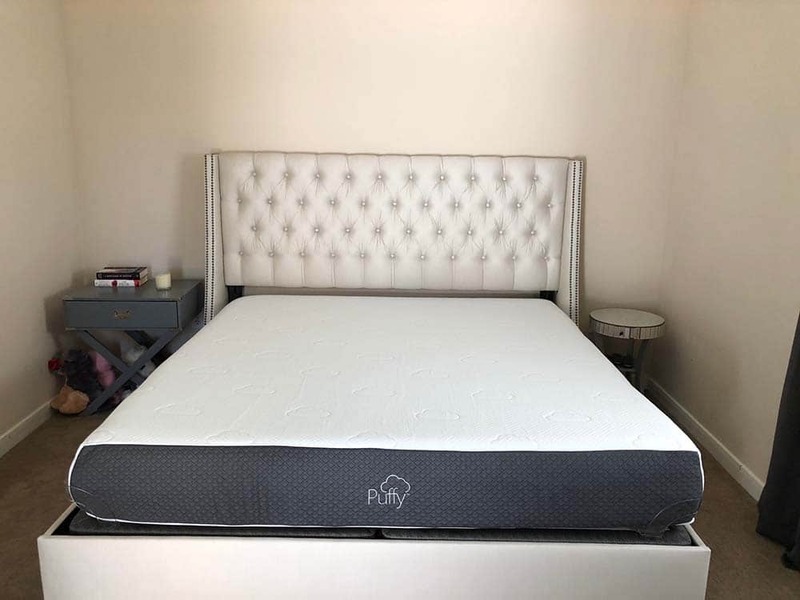 Our Puffy mattress review takes a look at this new company that recently came onto the market promising great sleep at a great price. The founders of Puffy wanted to come up with a mattress that felt like you were sleeping on a cloud, and thus the Puffy was born. 2″ Top Cooling layer – The top layer is made of 2″ of patent pending Cooling Cloud gel infused memory foam designed to provide cooling cooling and comfort. 2″ Support Layer – This layer is made of 2″ of special ClimateComfort Foam designed to keep your spine properly aligned while providing extraordinary pressure relief on all temperature and humidity levels which makes it resistant to contractions and expansions that often occur from extreme temperatures. 6″ Bottom layer – This foundation layer is made of 6″ of dense support foam, that is designed to be responsive and the company claims 4x the support of traditional support foam layers. The Puffy mattress utilizes their patent pending DeepSleep technology that makes up their top cooling layer that helps keep the mattress cool and comfortable, and the DeepComfort core support layer that provides the underlying support for sleepers. The Puffy has a extremely soft cover that works to provide a cool surface and comfort as well as wick way heat and moisture. The Puffy is a universal comfort type memory foam mattress, designed to appeal to a wide range of sleepers. We felt that the Puffy is a medium soft mattress, coming in around a 5/6 out of 10 on the firmness scale (10 being firmness.) Puffy has their own firmness scale on their site, which they rate a little firmer, in the range you see below. As always, firmness is largely weight dependent, as I compressed the top comfort layer more than Kaye did since I weigh considerably more than she does (230lbs vs. 115). She felt it was a little firmer than I did, but much less so than other similar mattresses. For me personally, the Puffy is on the softer side, due to my weight quickly pushing through the top comfort layer and compressing quite a bit. My weight was fairly distributed when lying on the mattress, but when I sat up in the bed, I felt the harder support layer as I “bottomed” out when sitting up. The foam layers do a good job of providing support during sleeping, and worked well for us as side sleepers by supporting our hips and shoulders without causing numbness or stiffness which often is the case with firmer mattresses. The Puffy is a rather comfortable mattress, albeit for one that is on the softer side as mentioned. The top comfort layer of foam provides a bit of responsiveness and bounce without causing too much sinkage as expected. Again, this is highly dependent on sleeper weight, as my heavier weight pushed down into the mattress much more than Kaye with her lighter weight. The exterior of the Puffy is very soft and comfortable, and the top comfort layers do a good job at providing a comfortable sleeping surface. The softness of the cover combined with the initial soft response from the memory foam layers did make for a comfortable nights sleep, and this was shared by both of us. The Puffy mattress does a good job of sleeping cool from the thin cover and presence of the gel infused foam layer designed to provide air flow and breathability. We did not feel any discomfort or stickiness that is often the case with all memory foam mattresses, and the Puffy does well in this respect. We would rate the Puffy as about average in terms of not sleeping hot, not necessarily better than most memory foam mattresses in this regard, but also not causing us to wake up sweating and sticky. In terms of sinkage and motion transfer, again with many of these mattresses it is highly dependent on sleeper weight. As I weigh considerably more than Kaye, around 230 lbs, I tend to sink a lot more into the mattress when sitting up or on the edge. This was particularly true of the Puffy. When sitting on it, I compressed almost all the way through the mattress. There was a little bit of sinkage with the Puffy, but nothing too extreme. This tends to be the case with most 10″ mattresses with only a few layers, and was to be expected for the most part. This is more a function of my heavier weight, as mentioned, which causes many 10″ mattresses to sink when sitting up on the bed, or sitting near the edge. Edge support when sitting near the edge wasn’t the greatest, again – due to my heavy weight at 235 lbs. Kaye didn’t experience the same degree of sinkage, however, as she is half my weight. Lying flat seemed to disperse the weight and thankfully, it didn’t cause me to feel like I was “rolling off the edge” of the mattress. Again, my heavier weight is to blame given the mattress is only 10″, and for heavier sleepers these beds sometimes experience sinkage and less edge support when sitting on the edge. There was some motion transfer when I adjusted positions during the night which again is to be expected from the weight differential, but not too much given its a memory foam mattress which as rule, does well with minimizing motion transfer. All in all, the Puffy mattress does a good job with sinkage and motion transfer, on par or better than most memory foam mattresses in its class. There was a small degree of off-gassing / smell but nothing overpowering compared to some other mattresses we have reviewed. We give the Puffy good marks in this category, and any smell that was present dissipated quickly. The Puffy mattress is pretty standard when it comes to their warranty and support offerings. Most mattresses in this category share about the same offerings in terms of sleep trials and warranty, and Puffy is no exception here. The Puffy is reasonably priced, with a queen selling for $950 which given the comfort and quality of materials, is a rather reasonable price.. The Puffy mattress does a good job of appealing to a wide variety of sleepers with a medium firmness feel on average depending on sleeper weight. Their patent pending gel infused memory foam construction combined with their denser support foam and foundation layer does a good job of providing balance and pressure relieving support as well as a comfortable nights sleep. The Puffy sleeps fairly cool and is a good choice for couples that may have different firmness preferences. There was a minimal degree of motion transfer and sinkage, except maybe for heavier couples, but is a good mattress for the money and materials included in the design. All in all, the Puffy is one of the better universal comfort mattresses on the market, and a great choice if you are looking for a 10″ foam mattress that sleeps cool and at a reasonable price. I bought this mattress about a month ago. It came in a large box and was super easy to install on my bed. I had been having trouble with a backache on my old mattress so needed a new one. I absolutely LOVE this mattress. It is super comfortable and gives me just the right amount of support to give me a wonderful nights sleep. I often hate to get up in the morning. I highly recommend this mattress. I love this mattress! I am not picky about a lot of things in life, but a mattress is one of those things. I do not sleep well if it sinks too much, moves around, is too soft (the firmer the better. This mattress would work for me for many years! Hello there! I simply want to give you a huge thumbs up for your great info you’ve got here on this post. I’ll be coming back to your blog for more soon. I bought this mattress two months ago and it does not live up to the hype about coolness. It is hot, hot. I wake up several times a night because I am hot. I only have a poly/cotton sheet over the mattress, so I don’t understand why they say it is cool. I agree, it sleeps very hot to me. I love the puffy way it feels, but wake up burning hot. Unfortunately I am returning it. In today’s Puffy vs Nectar review, we’ll be comparing two mattresses that offer a luxurious, cloud like feel promising optimal comfort and support. These are the Puffy and the Nectar mattresses. Both are relatively new on the market, and both offer a luxurious, cloud like feel and an optimal level of comfort and support necessary for a quality night’s sleep. If this sounds like what you look for in a mattress, maybe one of them will be a perfect match for your needs. Read the full Puffy vs. Nectar review. Read the full Puffy vs. Loom and Leaf comparison. Read the full Puffy vs. Nolah comparison. Click here for more Puffy mattress comparisons.